Similarly, there were many teachers from other schools said that this event gives an opportunity to learn about various cultures, especially Japanese culture which cannot be taught in class. 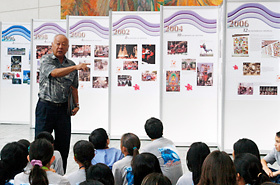 The Educational School Tour began with lecturing on the history of the Honolulu Festival. 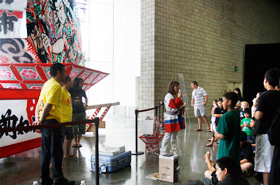 The students learned about the purpose of Japanese summer festival from the Honolulu Daijayama Booster Group. Also, the students were lectured on the Hirosaki Neputa and Daijayama while they observed the Neputa and Honolulu Daijayama which were displayed. Furthermore, the students got to experience the Japanese traditions such as games, artistic origami in which they’ve enjoyed. Moreover, they experienced playing various types of taiko drum where the students felt the vibration and the different sounds of the drums. In addition, the students experienced the yosakoi dance which is a traditional dance originated in Kochi Prefecture. Furthermore, the indigenous people of Alaska and Australia presented their own culture and dance. Some students noticed a different English dialect compared to the accent of English in Hawaii, which felt new to them. 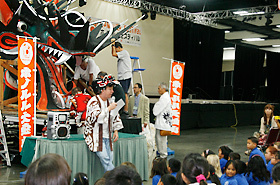 The children were given a lecture on Hirosaki Neputa in front of a gigantic lantern. 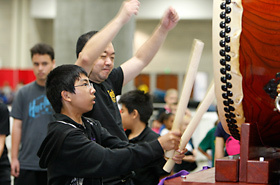 The students experienced the yosakoi dance using the Japanese instrument called naruko clappers. Many felt the low vibrating sound of a big Japanese drum for the first time which was powerful. 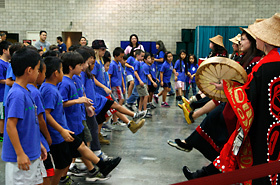 The students experienced the culture of Alaska Natives with the Alaska Native Heritage Center Dancers. We felt the passion of each participating group to teach the next generation about their culture and traditions, which the children listened carefully and were full of curiosity. 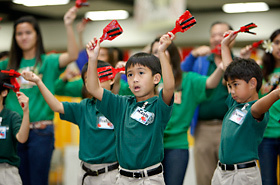 Also, we believe that the youth of Hawaii were able to discover the existence of different cultures through this tour. They also learned that each culture is preserved and passed on to the next generation. We will continue to host the Educational School Tour for an opportunity for cultural exchange and world peace!